Vasculopathy is an increasingly recognised partner to inflammatory rheumatological disease. Raynaud's phenomenon (RP) is generally considered a benign vascular manifestation. The natural history of systemic sclerosis (SScl), however, suggests that we underestimate the significance of RP in this context. RP occurs in approximately 90% of SScl patients, often decades before the diagnosis is recognised, and is a harbinger of generalised vasculopathy. Pulmonary arterial hypertension (PAH) is another manifestation of this process, which occurs in approximately 12% of SScl patients . PAH accounts for approximately 50% of mortality in limited SScl and accounts for approximately 7% of mortality in diffuse SScl. It is probable that the vasculopathic processes underlying RP and PAH contribute to the familiar pattern of skin, renal and gastrointestinal pathology. The emergence of effective and conveniently administered therapy for PAH increases the importance of diagnosis and monitoring of this complication. Furthermore, since many principles of PAH management translate to the management of RP, this raises the possibility that the generalised vasculopathy of SScl may also be modifiable. In the characteristic microangiopathy of SScl, luminal narrowing results from a combination of intimal proliferation, medial hypertrophy and adventitial fibrosis . This leads to a state of progressive chronic organ ischaemia. Dysfunction of cellular components of the arterial wall and dysfunction of inflammatory and haemostatic systems are interrelated (Fig. 1) [3, 4]. Endothelial cell dysfunction is characterised by decreased production of the vasodilators nitric oxide and prostacyclin, and by enhanced release of endothelin-1. Endothelial cell dysfunction influences the behaviour of vascular smooth muscle cells and adventitial fibroblasts, which mediate the proliferative changes and sclerosis in the sclerodermatous arterial wall. An appreciation of the crosstalk between these arterial wall components underlies the therapeutic paradigm shift from the use of pure vasodilators to agents with antiproliferative activity . Endothelin receptor antagonists (ERA) are in the vanguard of these new management strategies. Phosphodiesterase (PDE) type V inhibitors, angiotensin-converting enzyme inhibitors and angiotensin receptor blockers are also promising. 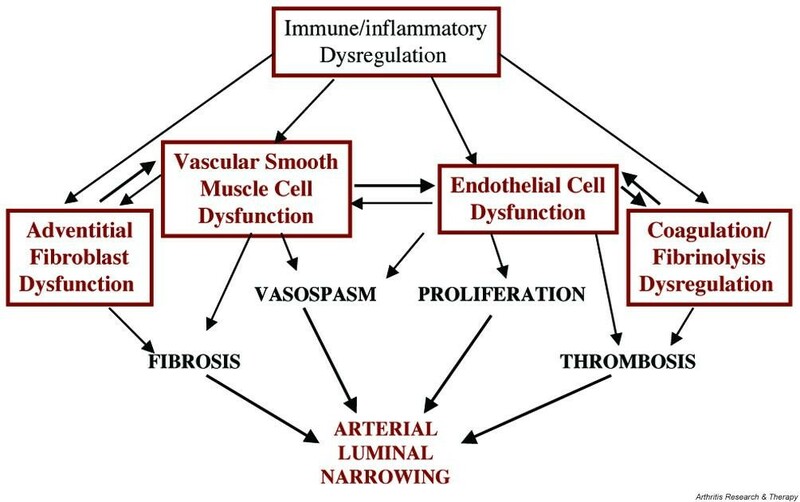 Dysfunction of cellular components of the arterial wall and of inflammatory and haemostatic systems are interrelated. Endothelin-1 causes vasoconstriction and vascular smooth muscle cell proliferation, promotion of inflammation and fibrosis [5, 6]. Two double-blind, placebo-controlled trials of an oral ERA, bosentan, were published in 2001 and 2002. These reported significant improvement in pulmonary haemodynamics and exercise capacity (P < 0.001) in patients with both primary and SScl-associated PAH, following a treatment period of 12–16 weeks [7, 8]. Subgroup analysis suggested that the prognosis of PAH in SScl was worse than the prognosis of primary PAH but that the relative benefit of bosentan was similar in both contexts. Although bosentan was generally well tolerated, it was associated with a dose-dependent increase in hepatic aminotransferases, which resolved on withdrawal of the drug. Although encouraging, these studies could not predict whether benefit would be maintained long term or, indeed, whether the apparent efficacy would translate into decreased mortality. An extension study from the two trials combined collates data from 169 patients with severe (World Health Organisation Functional Class III or Class IV) primary PAH, who received bosentan as first-line therapy (i.e. no prior exposure to prostanoids) for up to 3 years . Survival was calculated, according to baseline haemodynamic status, using a formula based on data from 187 primary PAH patients in the National Institutes of Health Registry, and was compared with predicted survival. The study indicates that bosentan substantially increases survival, with survival estimates at 1 year and 2 years of 96% and 89% compared with predicted survivals of 69% and 57%, respectively. Although abnormal liver function tests occurred in approximately 15% of the patients, no serious hepatic sequelae were documented in this group. Since the prognosis of PAH is generally worse in SScl, survival is likely to be lower in this group, but the data from short-term studies suggest that a similar relative benefit of bosentan may be anticipated [7, 8]. Data demonstrating the efficacy of ERAs in SScl-associated PAH and in patients in World Health Organisation Functional Class II are awaited. The combined vasodilator/antiproliferative/ antifibrotic activity of ERAs raises the exciting prospect for management of peripheral vasculopathy in SScl. Last year, the RAPIDS-1 study reported that bosentan approximately halved the incidence of new digital ulcers in patients with a history of digital ulceration . The RAPIDS-2 study, designed specifically to assess the effect of bosentan on ulcer healing, is expected to report later this year. Other medications that may combine vasodilator and antiproliferative activity include angiotensin-converting enzyme inhibitors, angiotensin receptor blockers and PDE type V inhibitors . The use of angiotensin-converting enzyme inhibitors in SScl to prevent scleroderma renal crisis is well established . Studies in animal models have suggested that angiotensin-converting enzyme inhibitors and angiotensin receptor blockers prevent the development of PAH by a combination of mechanisms including vasodilation, reduction of vascular smooth muscle proliferation, reduced collagen deposition and inhibition of NF-κB activation [5, 12, 13]. Since there are commonalities in the pathophysiology of PAH and RP, particularly in the context of connective tissue disease, inhibition of the renin–angiotensin system may prove effective in RP. A pilot study of the angiotensin receptor blocker losartan is encouraging. In a 12-week randomised trial of losartan versus nifedipine in 25 patients with primary RP and in 27 patients with SScl-associated RP, losartan was significantly more effective than nifedipine in reducing both the frequency and the severity of attacks . PDE type V inhibitors such as sildenafil inhibit the degradation of cGMP, which mediates the signalling of several endogenous vasodilators . Studies suggesting efficacy of PDE type V inhibitors in animal models of PAH have recently been supported by a small randomised, placebo-controlled, double-blind crossover trial of sildenafil in primary PAH. Twenty-two patients completed the study, and treatment with sildenafil was associated with improvement in symptoms, pulmonary haemodynamics and a 44% increase in exercise time (P < 0.0001) . Furthermore, a comparison of the efficacy of bosentan versus sildenafil, when added to conventional treatment for PAH, demonstrated that both agents improved the haemodynamics and exercise capacity, compared with baseline values, and that there was no significant difference between the agents . Similarly, use of open-label sildenafil as adjunct therapy in PAH patients receiving inhaled ilioprost appeared to improve symptoms, haemodynamics and exercise capacity . The apparent efficacy of PDE inhibitors in PAH has made them attractive candidates for treating RP. Case reports are encouraging but controlled trials are required. These approaches depart from the previously dominant strategy for both PAH and RP, which was to achieve symptomatic relief through vasodilatation . Calcium channel blockers are now recognised to have a limited role in the management of PAH. They also appear to be of limited benefit for RP in patients with SScl . In contrast, the prostanoids improve function and survival in PAH, and may also be antiproliferative. In the healthy endothelium, prostacyclin exerts vasodilatory and antithrombotic properties. Epoprostenol, a synthetic prostacyclin, improves haemodynamic and functional measures and improves survival in patients with primary PAH, although the impact on survival is less impressive in SScl. Continuous intravenous administration of epoprostenol confers risks of infection and thrombosis. More convenient routes of prostanoid delivery are also showing promise (e.g. subcutaneous trepostinil, oral beraprost and inhaled ilioprost). RP is symptomatic of a generalised vasculopathy in SScl, which eventually leads to a fibroproliferative arteriopathy. PAH is one of many serious sequelae of this process. Current evidence suggests that the symptom-led management approach for SScl vasculopathy is outdated and that the widespread use of calcium channel antagonists for RP is probably inappropriate. It now appears preferable to use agents for which there is some evidence of antiproliferative activity. Since these approaches will probably be less effective once fibrosis has occurred, it appears logical to implement them in patients with early SScl; clinical trials are required to test these proposals. However, there is room for optimism that the cold hands and strained heart may prove ushers of true disease-modifying therapy in this intractable disease. FCH is supported by the Arthritis Research Campaign and has received funding for a research nurse from Actelion.